Above is a strawman proposal for icons for user-submitted terms that I’ve been presenting in talks and in prototypes for creating privacy-protecting technology for individuals. I’ve been sharing this with people for the last couple of years to increasing recognition that we need a simple way to assert our terms. I made it up to demonstrate what and how user submitted terms might work, as part of a larger system for individuals to control and share their personal data. Basically, the idea is that an individual would select some default settings for sharing their data, and this would be managed by a user-agent which would use a ‘machine readable’ version of the user-terms. 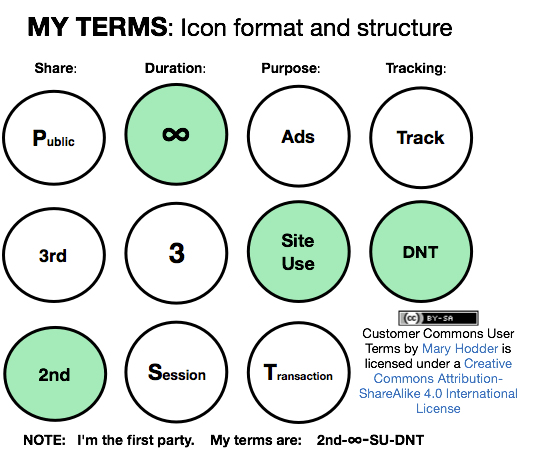 The individual would see the icons, but also be able to read the ‘human-readable’ terms connected to each category of choice and the individual icons chosen. And there would be a ‘legal readable’ version that be available for creating a legally enforceable agreement, if the individual and those they submit terms to agreed. And if the requested term was not agreed to, the individual would know and be able to choose whether to share data anyway. You can see the choices for terms, including Sharing. This might involve allowing shared data to be public, or shared with 3rd parties, or just sharing with the direct 1st party relationship. Duration might be for as long as there is an active account, for say, 3 months, or for just the extent of the business session. Purpose might be for 3rd party advertising, for just site use, or for the extent of the business transaction. And Tracking might allow either tracking or Do Not Track choices. These choices are simple and easy for a person to understand, and should be the sort of thing that is selected once, and then the general choices become defaults. It might be that there are a few defaults, say for news sites or apps, verses say, for social networks, or for entities we purchase from. We might want to get really granular with some relationships we have that really matter to us, and specify a set of terms just for that vendor. But the net of this is that individuals would be able to say what matters to them before they share any data, and their agent could negotiate the relationship with a potential vendor, to make it easy and painless. Customer Commons, as advocates for individuals, could develop and maintain for public use these terms and their icons. We could provide this part of the puzzle for a privacy protecting system to help individuals have more control over their own sharing. And we could help vendors navigate these negotiations with customers so that vendors might use better privacy as a competitive advantage in the marketplace. All of this, the choices we individuals make and submit, and the responses from vendors, ought to be recorded in a Consent Receipt, something Open Notice has been working toward and which is very complementary to user-submitted terms. I’d love to hear what you think in comments about this idea. Customer Commons User Terms by Mary Hodder is licensed under a Creative Commons Attribution-ShareAlike 4.0 International License.